Its easy for Wedding Videos to feel similar. After all, most weddings share the same events and timeline. As film makers its our job to emphasize the unique aspects of the day and most importantly the couple. Jessica and Cody made this so easy for us. 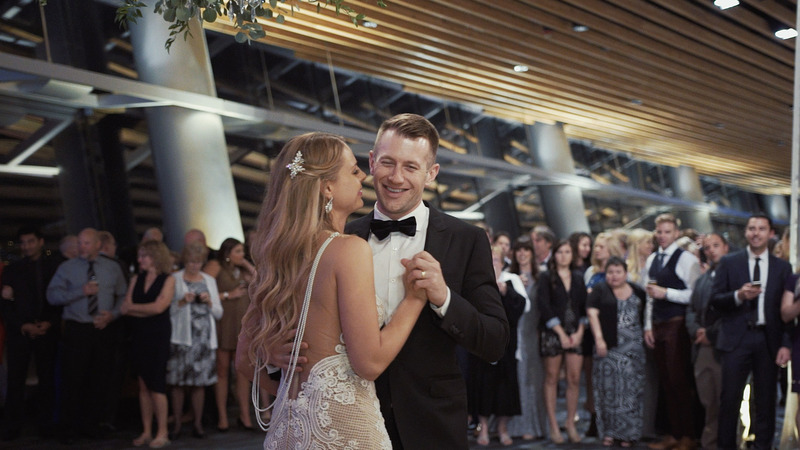 Their wedding at Cecil Green and the Vancouver Convention Centre was filled with personalized touches. But more interestingly they literally threw themselves into the forefront of their film in a way that we haven’t seen before. It was Jessica that suggested that she record a message for Cody as a surprise in their Wedding Film. I have to say I was a little hesitant at first because things like this often don’t work out. I’ve seen THOUSANDS of wedding videos and films over the years and addressing the camera can often feel awkward and just not a genuine in-the-moment moment (if that makes sense). But as you can see, there’s a lesson to be learnt here because it really can work. I remember thinking “GOLD!” as soon as Jessica finished speaking. It was short, sweat and absolutely perfect. About as genuine as you can get and full of emotion. We always have different ideas floating around, ready to see what works, and sometimes you realize that it doesn’t matter what the idea is, as long as its genuine and comes from the heart. If someone is enthusiastic about an idea, then we should always try it out. Cody was a little more nervous in front of camera and so we decided to do a short, pre-ceremony interview. Just a casual recorded chat about the day and how they had got to this point in their lives. Cody was so open, filling us in on their history, their family, their son Hudson and how he felt about their relationship. As a father to a child, just a few months older than Hudson, I could really relate to so much of what Cody talked about. “It feels like coming home” really does some it all up. To us, Wedding Cinematography is all about connecting with characters and doing our best to understand who they are. We want to relate to them and share in their emotional journey. I think this is a great example of a couple allowing us to reflect their personalities and lives by giving themselves fully to the experience. Something else I love about this film is the journey that Jessica and Cody took us on through Vancouver. Beginning at the Fairmont Pacific Hotel and ending at the Vancouver Convention Centre via Cecil Green Park House at the University of British Columbia. It might have rained a little, but we were compensated with bright personalties and a spectacular reception decorated and planned by the amazing Dream Group Productions. We also had the opportunity to shoot along side the very talented and super chill Jamie Mann which was a great experience. Jessica and Cody were the last couple we worked with in Vancouver for 2016 and it felt so great ending the season on a high. Just a few months to go before we kick things off again!